I hope the hollyhocks will quit sulking & behave properly! For once I can relate to most of what's growing in your garden, though the agapanthus would be a container plant for me. Agapanthus are built to withstand even the toughest summer conditions. Those hollyhocks have a mind of their own. Everything else is beautiful! Hollyhocks do have a mind of their own. Mine keep inching toward the front of the bed each year, no doubt on the hunt for more sun! Finally planted a few new ones this year as the old ones are looking pretty peaked. Love your agapanthus which is a container plant for me. Lovely photos! 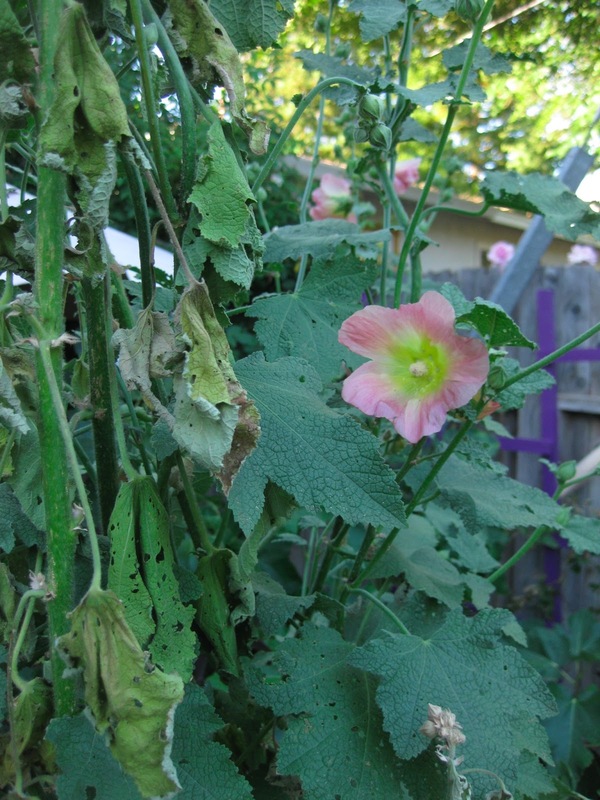 Could be that your hollyhocks just wanted to take a siesta in this July heat! I don't see any rust on yours, but my hollyhocks suffer terribly from rust. I did plant the fig leaf hollyhock because I read that it was rust resistant...well, maybe a bit more resistant. You do have some very pretty flowers for Bloom Day though! How strange about your Hollyhocks...glad they seem to be recovering...and yes, the Hummers will thank you for that Agastache!